FlexiCol Hydrocolloid Wound Dressing from HealthyKin.com is a latex-free, conformable, vapor permeable hydrocolloid dressing with excellent contact adhesion for quick and secure application. FlexiCol handles wound drainage with a combination of absorption and evaporation. Unlike other dressings that tend to pull away soon after being applied, FlexiCol stays secure for days after its first application so re-application or securing with tape is eliminated. FlexiCol's thin film exterior and moist core allow for higher and quicker fluid uptake so most residue does not remain in the wound. Peel-off tabs and a thin beveled edge make application quick and prevent dressing roll-off. 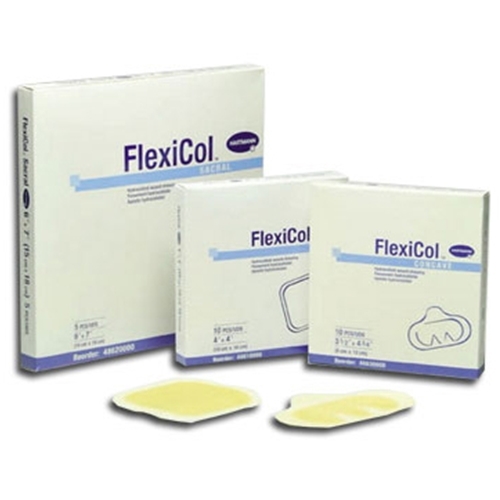 FlexiCol folds easily to conform to difficult-to-dress areas and is available in two shaped dressings for wounds on the sacrum, heels and elbows. FlexiCol is indicated for use in managing light to moderately draining chronic and acute wounds including: pressure ulcers, leg ulcers, second degree burns and superficial burns and abrasions. good product with various possible uses. I have used it on bed sores on the heels. Extremely difficult to heal. This product has helped to bring them to at least a semi comfort range. Perfect for maintenance of persistent wound. Just what I ordered - fast delivery.